REVIEW OF LATEST BBM 8.5.3.9 & 2.9.0.45 FOR ANDROID. range of people. 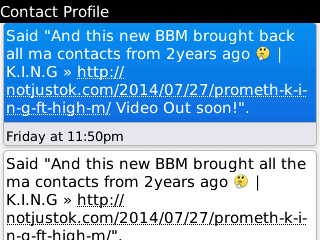 The previous BBM won't go beyond 2000+ contacts but this new BBM is way beyond that 5000+ contacts. This is a really huge come back for this App. A lot of people as been testifying to the goodness of this new BBM which returns back all your contacts no matter the years you've registered on the app world it will bring all the contacts gone for years. Talk is cheap get yours below. Share for others to enjoy this also. Re: REVIEW OF LATEST BBM 8.5.3.9 & 2.9.0.45 FOR ANDROID.